The Handley Page HP.115 was a British delta wing research aircraft built by Handley Page to test the low-speed handling characteristics to be expected from a supersonic airliner of slender configuration. It formed part of the British supersonic aircraft research programme sponsored by the Ministry of Supply that eventually emerged as the Concorde. The HP.115 was designed to explore the low speed envelope of slender, delta wing aircraft. 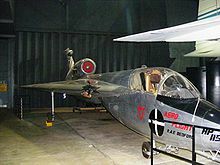 It was originally intended to be a glider, being towed by a Canberra aircraft to high altitude of around 30,000 ft (9,140 m). After reviewing costs, it was estimated that a powered version would achieve 200% more flying time at 95% less cost per hour. It featured a delta wing of very low aspect ratio swept at 75� and a fixed tricycle undercarriage derived from the main gear of a Percival Prentice and the nosegear from a Miles Aerovan . The fuselage was quite slim and narrow except at the nose where it bulged to give space for the cockpit. 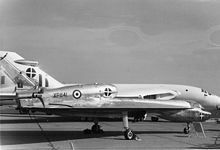 It was powered by a single Bristol Siddeley Viper turbojet set at the base of the tailplane fin. The aerofoil section was a modified bi-convex type with the maximum thickness at 40% of the chord. This section was chosen as being representative of the type likely to be adopted for a supersonic transport. It had a favourable chordwise distribution of crosssectional area and hence a low wave drag in supersonic flight. A unique plywood leading edge was employed wherein new sections of different degrees of camber could be substituted although in practice, this feature was never used. The single aircraft XP841 flew for first time on 17 August 1961 at the Royal Aircraft Establishment Bedford, with J.M. Henderson at the controls. It was subsequently used for low speed research in support of the Concorde development programme while the BAC 221, (a modified Fairey Delta 2) covered high-speed research. The HP.115 was a very capable aircraft; pilots were able to demonstrate rapid changes of bank, while still safely retaining control at speeds as low as 69 mph (111 km/h). Despite two minor mishaps, the experimental programme was a very lengthy one continuing until 1974, providing significant data regarding delta wing operations in takeoff and landing. Neil Armstrong was due to fly the HP.115 as a test pilot in 1962, but after his selection as an astronaut, NASA refused him permission to fly the aircraft. He eventually flew it in 1971. The HP.115 is preserved at the Fleet Air Arm Museum, Yeovilton forming part of "The Leading Edge Exhibition," alongside the BAC 221 and a Concorde prototype. Barfield, Norman. "A�rospatiale/BAC Concorde." Aircraft in Profile, Volume 14. Windsor, Berkshire, UK: Profile Publications, 1974. ISBN 0-85383-023-1. Handley Page HP.115 Pictures and Handley Page HP.115 for Sale.